Cook up a pot of spicy chili or a vegetable soup for chilly winter evenings while you're busy doing something you enjoy. • Healthful: You can cook tasty, low-fat meals without grease, butter, or oil. If the recipe calls for liquid, use water or broth. Foods covered and cooked at lower temperatures, retain more vitamins and nutrients than when they're boiled or fried. • Frugal: Less expensive foods taste better cooked in a slow cooker. 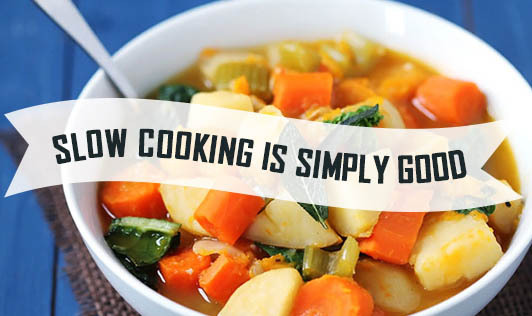 The low, moist heat helps vegetables like potatoes, carrots, and cabbage, cook up tender and flavorful. Leaner cuts of meat become tender and shrink less when cooked in a slow cooker. And, it takes less electricity to use a slow cooker than it does to use a stove top or oven. • Convenient: A slow cooker can make life a little more convenient.With a little early planning, your meal is ready when you are. • Safe: Slow cookers operate at a low temperature - generally between 170? and 280? F. According to the U.S. Department of Agriculture, the direct heat from the slow cooker, lengthy cooking time, and steam created within the tightly-covered container combine to destroy bacteria for safe cooking. Source -U.S. Department of Agriculture. 2008.